and plant products to that country and for plant quarantine officials. Decrees should be consulted for the exact texts. to that circular, dated October 24, 1950. Decree No. 14 of November 8, 1929, from La Gaceta of November 9, 1929, as amended by Decree No, 701 from La Gaceta of September 13, 1949. 2. The importer shall apply to the Department of Agriculture for a license to Import live plants and parts thereof, such as roots, tubers, bulbs, rhizomes, sprouts, etc., the seeds of forage and vegetable crops for planting or immediate consumption, and of ornamental plants and trees. The Department of Agriculture will examine reproductive plants as soon as they arrive In the country and if they are found in perfect sanitary condition, it shall advise the interested partyand the Ministry of Finance so that the plants may be cleared from the customhouse. 3. In case an examination should determine that the importation is the carrier of pathogenic agents, it shall be destroyed with previous notification to the owner who shall attach no liability to the Government for the loss. 4. 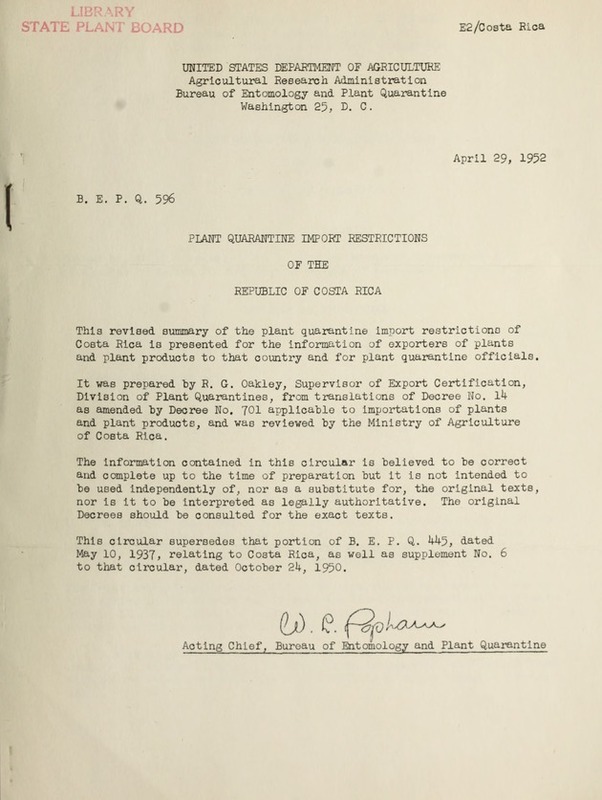 The Department of Agriculture is authorized to import any class of plants, including those listed in regulation 1, for experimental purposes without being subjected to above procedure.